Summary: Another example of how the intricacies of narrative and plot flounder in the journey from comic to cinema. Based on the graphic novel by Alan Moore, V for Vendetta is set in a futuristic London crumbling under the grip of Norse Fire and, more particularly, John Hurt’s fanatical Adam Sutler. It is a bleak vision of a city whose inhabitants have been stripped of every freedom imaginable and live in constant fear of the looming Finger. Hugo Weaving adopts the visage of perpetual anonymity to play V, our flame-grilled anti-hero; where as Natalie Portman goes all Sigourney on us and takes on the role of his side-kick, and love interest, Evey. Moore has every right to feel somewhat aggrieved at the poor representation his work has suffered in terms of cinematic adaptation in both From Hell and The League of Extraordinary Gentlemen. 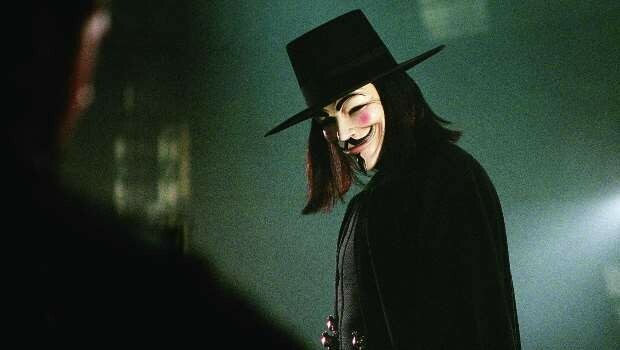 While V for Vendetta is definitely a more notable attempt it doesn’t quite succeed in making it to the upper echelons of comic book cinema currently occupied by the likes of Sin City. As a stand-alone film, V for Vendetta succeeds as an entertaining action thriller with lofty aspirations of being politically insightful and relevant. These high-concept predispositions seem to be a hallmark of the brothers Wachowski and during the film the audience will no doubt hark back to the awful dialogue of The Architect in Matrix Reloaded. The principle failure of V for Vendetta is that McTeigue allows the troublesome bedfellows of action and designer dialogue to preoccupy him. As a consequence he loses much of the gritty realism and harrowing story that made the novel so captivating and this proves to be the movies main downfall. There is a great deal lost in the transference from page to screen and the suffocating and paranoid London of Moore’s novel is given a good deal too much gloss. McTeigue and his team were granted virtually unparalleled access to some of the city’s most treasured buildings and, as a consequence, perhaps saw fit to provide us with a postcard London to make up for that the city gets a wee bit blown up in places. In short, the many complexities that made the comic so wonderful have, by and large, been ostracised and replaced with Mexican stand-offs and back-alley knife fights that overdose on special effect wizardry. As with any modern day comic book adaptation McTeigue and V for Vendetta will succumb to the same level of scrutiny as Hulk, Daredevil and Hellboy. The sad fact is that V comes far closer than the previous trio in delivering a half-decent reflection of the book but is let down by sloppy amputations of the original. The majority of the more striking moments such as Finch’s acid fuelled excursion to V’s prison camp are cut and replaced with unnecessarily long slow-mo fight sequences. If you were a fan of The Matrix trilogy you will no doubt enjoy the many nods to Neo and the gang made throughout the film, not least in the grandiose martial arts and flying sai, and this should prove sufficient for a reasonable box office return. The film has a cast of remarkable pedigree from the likes of John Hurt (The Elephant Man, Contact) to Stephen Rea (The Crying Game, Interview with the Vampire) and none of them disappoint. Hurt is at his chilling best as the Norse Fire leader Sutler and proves to be a worthy hate-figure for the audience and Rea excels as the disenchanted detective on the tail of Weaving’s terror suspect V.
Ultimately, V for Vendetta will satisfy the insatiable appetite for effects heavy martial arts movies with delusions of grandeur but is yet another example of how the intricacies of narrative and plot flounder in the journey from comic to cinema. The key performances of Natalie Portman, as Evey, and Stephen Rea, as Finch, lift the film above the humdrum of Daredevil and Elektra but too much of the original is sacrificed or altered to little or no benefit.